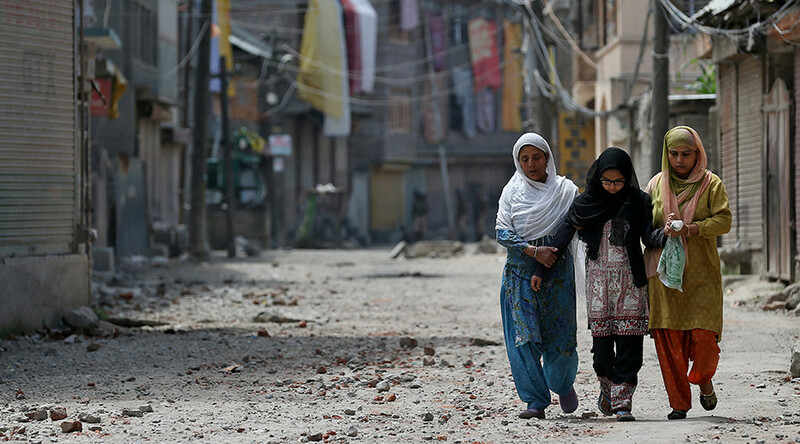 A photojournalist in Kashmir stepped out from behind the lens to help a young girl after she was hit by a stone. Dar Yasin has received praise for the moment he dropped his camera to help the girl he claimed reminded him of his daughter. “Proud of you colleagues. This is a commitment to embrace and embed social responsibility into our personal and professional values” journalist Yusuf Jameel tweeted along with the image. Despite Yasin dropping his camera the moment was captured by another photojournalist, Faisal Khan. Khan shared the photo on Facebook along with a description of the events preceded it on Thursday. The young woman was hit in the head by a stone during a protest in Srinagar, the capital of Indian controlled Kashmir, wrote Khan. He said it was reportedly thrown by a “paramilitary trooper,” but young Kashmiri students have also been photographed throwing rocks at the scene. The region has been embroiled in violence in recent weeks as police clash with protesters amid calls to boycott elections in the disputed area. Further division is caused by police dispersing stone-throwing protesters using force and tear gas, with dozens reportedly injured in the chaos. “I told the girl’s friends that I have two daughters and this girl is just like one of them. If you are the father of two girls or if you are a father of any child, you cannot just see anyone’s child helplessly suffering like that,” Yasin told the Hindustan Times. “I am not the first one to have done this. I can tell you there are so many guys on the field in Kashmir who would have done the same what I did that day,” he added. Yasin said the girl was taken by cab to the hospital where they were treated and are now stable.